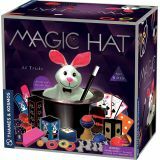 With the magic hat and rabbit puppet, as well as more than 40 other magic props, kids as young as 6 years old can learn and perform 35 magic tricks. The color manual teaches most of the tricks in three easy steps. With some practice, it becomes easy to stage a magic show filled with fun and successful tricks like pulling a rabbit from a seemingly empty hat, and make a ball disappear from a magic cup and change color. Ages 6+.